Welcome to the Kewa Dental Clinic. As a full-service facility, our team, under the supervision of licensed and highly skilled dental professionals, provide patients with a full range of treatments such as extractions, fillings, dentures, bridges, crowns, root canals, dental cleaning and more, as well as immediate care through emergency visits. Our mission is to provide the best possible dental care for our community and to build a practice which allows us to provide comprehensive care in a comfortable, pleasant setting to each patient with dignity, respect, kindness and understanding. Your dental professional will check for cavities, plaque and tartar on your teeth. Your gums will also be checked using a special tool to measure the spaces between your teeth and gums. The check-up will also include your tongue, throat, face, head and neck to look for any signs of trouble, swelling or cancer. Brushing and flossing help clean the plaque from your teeth but you can't remove tartar at home. During the cleaning, your dental professional uses special tools to remove tartar. This is called scaling. After your teeth are scaled they may be polished. In most cases a gritty paste is used which helps remove any surface stains on your teeth. The final step of the cleaning is flossing. Your dental professional will use floss to make sure the areas between your teeth are clean. You should call the dental clinic if you have a headache, earache or pain in your jaw that lasts for more than a few days. We have limited emergency walk-in appointments available. Please call for an appointment to shorten your wait time. If you call us when your symptoms start, we can prevent the need for an emergency visit. *Our hygienist regularly visits the Early Childhood Learning Center and the Elementary School to conduct examinations and apply sealants. Marcelle Martinez is our dental receptionist. She will be happy to schedule your appointment! You can reach Marchelle in the Dental Clinic directly by calling 505-465-3078. Prosthodontic procedures include crowns, bridges, veneers, inlays, on lays, complete and partial dentures. Dental implants have become the preferred method for replacing missing teeth, so many prosthodontic procedures today are done with implants as the support instead of the natural teeth or gums. A prosthodontist is a dentist who specializes in the esthetic restoration and replacement of teeth. The health of your teeth affects your whole body. What problems could poor dental health cause? Poor dental health affects much more than just your teeth! Did you know that your oral health offers clues about your overall health or that problems in your mouth can affect the rest of your body? 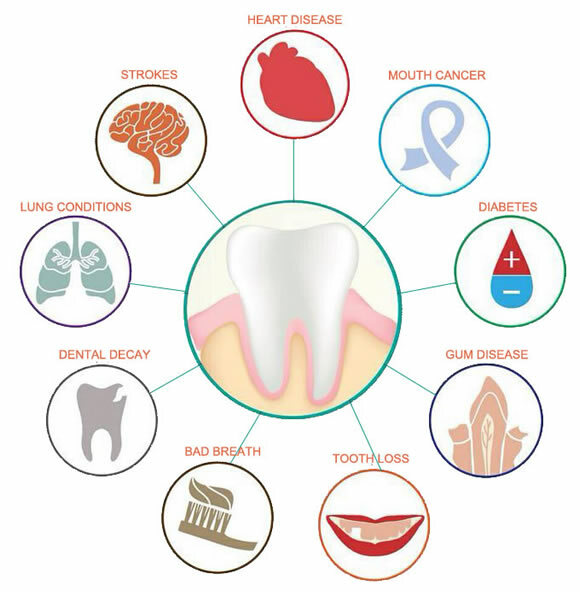 Protect yourself by learning more about the connection between your oral health and overall health. What's the connection between oral health and overall health? Learn more about cardiovascular disease, osteoporosis, Alzheimer’s disease and many other diseases affected by your oral health by clicking the link below. Meet Our Chief Dental Officer! Dr. Bethany Hann is a New Mexico native, born and raised in Albuquerque. After studying Spanish at Brigham Young University, she received her dental degree from the Ostrow School of Dentistry of USC, where she was on the Dean's List. During her time at USC, she was Student Director of AYUDA, a non-profit volunteer organization that provides free dental work to children in Southern California and abroad; she received student scholarships to help fund dental clinics where she helped treat children and adults in Panama, Belize, Colombia, Guatemala, and Mexico. As a dental student she was also awarded the Academy of General Dentistry Senior Award, which recognizes one senior dental student who has shown the most promise of being an outstanding general dentist. 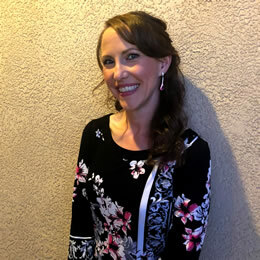 Dr. Hann returned to the Land of Enchantment to complete her residency in general dentistry at UNM Hospital, where she expanded her skills in particular working with pediatric and medically complex patients. Upon completion of her residency, Dr. Hann became an Associate Professor of Clinical Dentistry at the University of Southern California, in the Division of Dental Public Health and Pediatric Dentistry. She spent two years teaching dental students as they worked together to provide dental treatment to the homeless population of Skid Row in downtown Los Angeles. As a National Health Service Corps Scholar, Dr. Hann is committed to providing dental services to underserved communities. She recently returned home to New Mexico and worked in a private practice treating children in the Albuquerque South Valley. She is very happy to be serving the Santo Domingo Pueblo, providing quality dental care to patients of all ages! Her interests include green chile, photographing New Mexico clouds and sunsets, music, cooking, hiking, camping, and exploring the great Southwest with her husband, Robert. Dr. Snyder was born and raised in Albuquerque, NM. She received her Bachelors of Science in Biology, Bachelors of Arts in Religious Studies and Minor in Psychology while attending UNM. After undergraduate, Dr. Snyder moved to Milwaukee, WI to attend dental school at Marquette University School of Dentistry. There she met her husband, Jeff, whom she later married in Angel Fire, New Mexico. 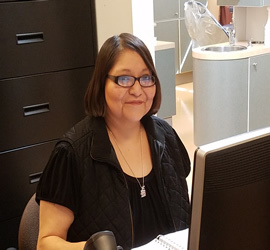 During dental school, Dr. Snyder was awarded the Indian Health Service Scholarship, which allowed Dr. Snyder the opportunity to work with several tribes after graduation. Her first job out of school was with the Taos Picuris IHS center. After a year, due to her husband’s schooling, they moved to Rio Rancho and Dr. Snyder worked for both Jemez Pueblo and Kewa Pueblo. Unfortunately, after a short time she was relocated to Oregon and worked two years for the Klamath, Modoc, Yahooskin Tribal Center. After two years, Dr. Snyder’s husband was accepted into the dental program at Midwestern University in Glendale, AZ. They moved to Glendale in 2014. Dr. Snyder worked for the Native Health Center in downtown Phoenix for a year. Then, in order to be closer to home, Dr. Snyder took a position as an associate dentist in Sun City West at a private practice and also became an adjunct faculty member at Midwestern University two days a week. 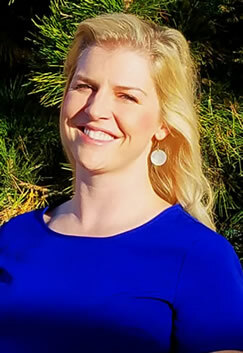 Dr. Snyder continued working as a faculty member for three years while living in Arizona, but left the private practice in Sun City West to take a position as a solo practitioner in a more rural community because she enjoys working with a more underserved community and making a difference. She was there for two years and absolutely loved it, but after her husband graduated dental school they returned back to New Mexico to lay down roots. They have a 14 month old son, and love being home closer to family. Dr. Snyder is thrilled to be back at Kewa Pueblo Health Corporation. Dr. Snyder loves New Mexican food, especially green chile chicken enchiladas and sopapillas, the sunrises and sunsets, blue skies and balloons. Christy was born in Virginia and at the age of ten, moved to Abilene, Kansas. She currently resides in Placitas, NM with her Husband, John, and has one daughter, Janea, who is attending NMSU in the animal science program with a future goal of attending Veterinarian School. Christy attended Wichita State University and graduated with a Bachelor Health Science-Dental Hygiene degree in 1984. 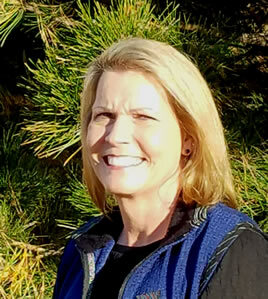 She moved to Albuquerque in 1988 and studied at UNM where she then earned her Local Anethetic license and a Masters of Health Education/Health Promotion degree in 1997. Christy has mostly worked in private practices in the Albuquerque and Rio Rancho areas as well as with Mira Consulting where she worked with the APS schools in their Prevention and Sealant Program for Children. Christy's mother and 3 siblings still reside in Kansas with their families. Christy loves to spend time outside with their horses, taking jazzercise classes and working out at the gym. She also does quilting and reads in her spare time.